A few days ago I had the pleasure of spending a couple of hours with Bob Rockwell. Bob is the managing partner of AdviSoar, a Lewisville, TX consulting company specializing in coaching and developing executives, and teaching people the skills to develop executive relationships. “Helping Good People Do Great Things!” is AdviSoar’s mantra. Monetary risk: the level of investment it takes till one can have a meaningful “sniff test”. Market risk: changes in the market in the window of time between concept and delivery. In particular, Bob is concerned about the risk of missing a market opportunity due to a too-constraining design document or a too-long development time. Additionally, Agile would seem to offer the potential of new discovery that could have market value. Competitive risk: a rival in the market starts delivering faster or “better” by adopting Agile methods. Execution risk: will the software be on-time? Will the business executive in charge get early warning signs in case the software project is in trouble? Brand risk: tarnishing of image due to poor quality or miss-met expectations. Innovation risks: shipping mediocre software (based) product due to insufficient experimentation and insufficient or ineffective “user” input through the process. In other words, Agile for Bob is about running and growing the business, not about running R&D. The investment in software development is typically less than half the overall life-cycle investment in software. The longer you take to address technical debt, the higher you pay. The accrual of business value in well run Agile projects is exponential (see chart above); in contrast, the investment is linear in traditional waterfall processes. 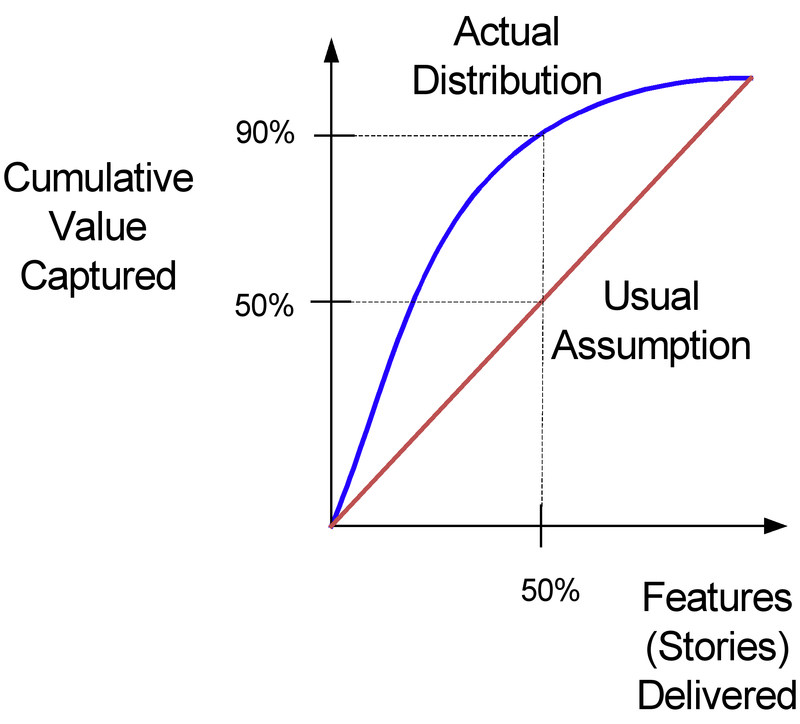 In the graph above, taken fromJim Highsmith’s Agile 2006 presentation “How to be an Agile Leader”, 90% value is captured upon delivering 50% of features.